Bulldogs win 3rd Straight State Championship! 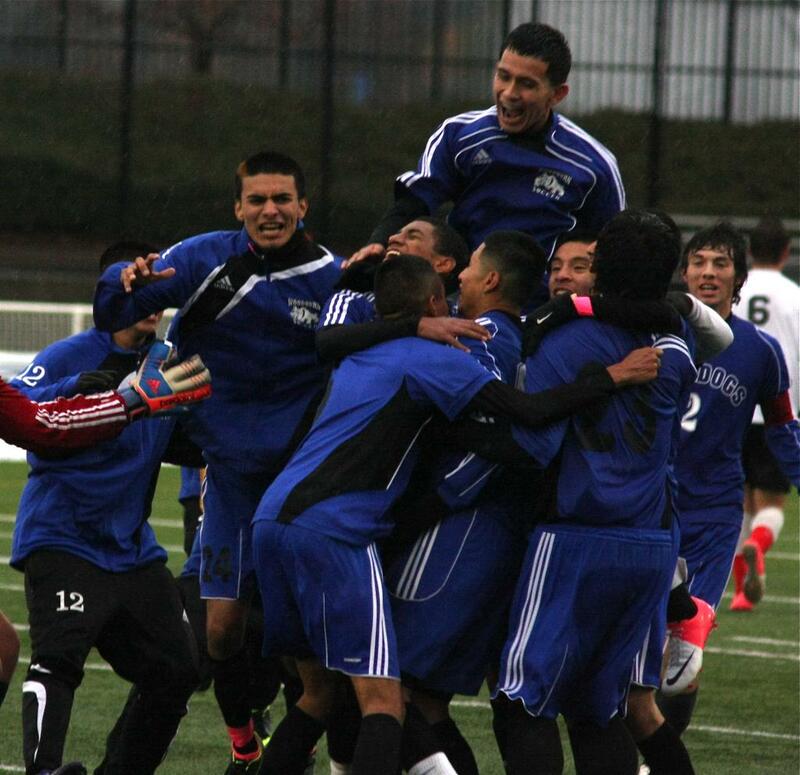 Jerry Ulmer, The Oregonian, November 17, 2012 1:48 p.m.
HILLSBORO — Woodburn’s supremacy in Class 5A boys soccer, firmly established the last two years, seemed a bit tenuous early this season. Luis Del Rio, who coached the Bulldogs to back-to-back state titles, had left to take over the men’s team at George Fox University. Replacing him was a first-year varsity coach in Carlos Horcos, who moved from Chile two years ago. The Bulldogs adjusted to Horcos’ passing-game style and once again rose to the top, completing their third consecutive championship run Saturday with a 2-1 win over Mountain View of Bend in the Class 5A final at Hillsboro Stadium. Woodburn (15-0-2) extended its unbeaten streak to 35 and improved to 50-2-2 in the last three seasons. Junior Michael Hobson said it was just a matter of time before it came together for the Bulldogs. Hobson and Rangel found the net in the first half as Woodburn took a 2-0 lead and held off the hard-charging Cougars (11-5-2) down the stretch. Hobson scored in the 19th minute, rebounding a hard shot by junior Cesar Ramos that bounced off junior goalkeeper Levi Schlapfer. Rangel added his team-leading 12th goal in the 33rd minute, splitting three defenders and firing past Schlapfer from point-blank range. “It was one of my better goals,” Rangel said. The Bulldogs pulled back to protect a 2-0 lead, and Mountain View, which entered with a Class 5A-best 65 goals, began to threaten in the second half. Freshman Zach Emerson led repeated charges, but the Cougars couldn’t put the ball past Woodburn junior goalkeeper Kevin Courtney-Vera. “It was inches,” Mountain View coach Chris Rogers said of the scoring chance. Woodburn finished with an 11-7 edge in shots over the Cougars, who were bidding for their first title since sharing one with Jesuit in 1999.